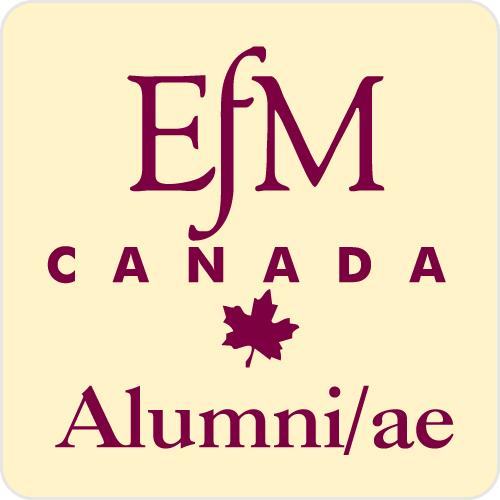 The new EfM Canada Alumni/ae Association was launched at the Joint Assembly of the General Synod of the Anglican Church of Canada and the National Lutheran Conference in Ottawa in July 2013. Graduates, former students, mentors, trainers and coordinators and Board members are all eligible to join. The cost is $25.00 per year (July 1-June 30). The proceeds will be deposited in the EfM Canada Bursary Fund to provide scholarships in all contracting dioceses and independently contracting parishes. We will also send you a very attractive lapel pin (see image above) that we hope you will wear to identify yourself as a member of the EfM Canada Alumni/ae Association. As the Association grows we hope to be able to help EfM Alums network with others in their area. Please click on the following link Alumni/ae Registration Form to obtain a copy of the resigistration form. Fill it in and send it to the EfM Canada Office for processing.